Utilizing an original storyline, players will have the opportunity to play as the killer doll and experience his exploits first-hand while extending his gory legacy. 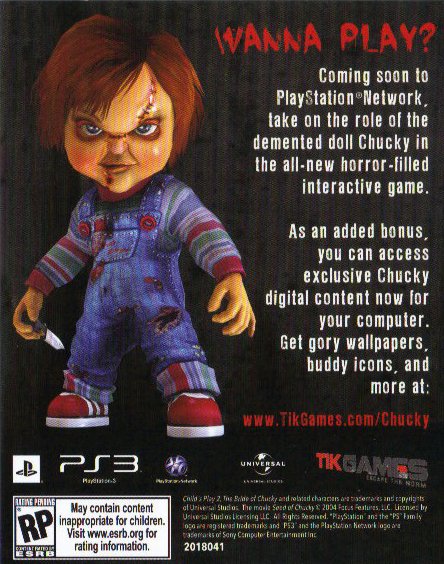 True to the nature of the films, Chucky will use his full repertoire of stealth and guile to dispatch victims in a multitude of distinctive methods. In the end it will be up to the player to decide how many (or few) people survive this stealth-action romp. Det lyder jo ikke helt uinteressant, i hvert fald lyder det mere spændende end de sidste to film i serien, “Bride of Chucky” (1998) og “Seed of Chucky” (2004), der begge er ret tarvelige film. Og ja, jeg ved godt, at mange sikkert vil mene, at serien allerede begyndte at degenerere i 1990 med John Lafias “Child’s Play 2” … men både nummer 2 & 3 er i min optik seværdige.